This is a 2 item bundle which includes a pair of dance shoes and dance shoe wire brush. The dance shoes are made by Very Fine Dancesport Company. These shoes are suitable to wear for ballroom dancing such as quickstep, Viennese waltz, tango, waltz, foxtrot, rumba, cha cha, swing, disco, samba, jive, etc. They comfortably fit on ones feet and are lightweight. They are made for dancers, like you, who wanted a pair of beautiful and stylish dance shoes that are affordable without sacrificing quality. 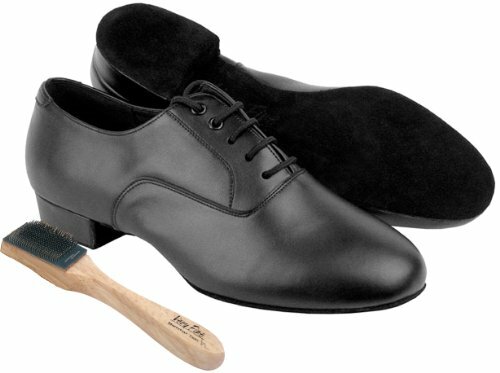 The dance shoe wire brush which is included in the package will protect your dance shoes from dirt. Dirt free shoes will enable you to move smoothly and freely on the dance floor. The practice of brushing your dance shoes outer sole with this wire brush will enable you to keep your shoes like new for a long time, thereby saving you some money. A complimentary carry on shoe bag is included.